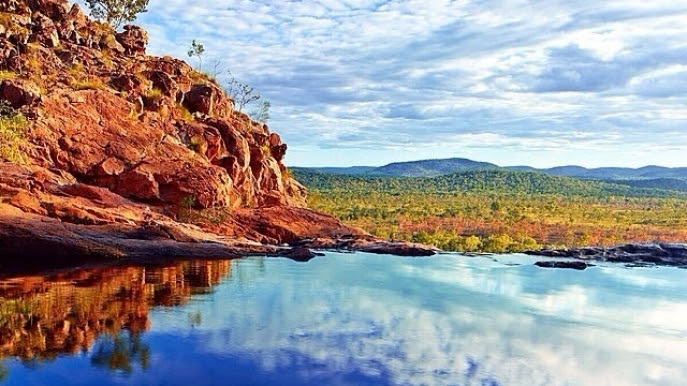 A little while back I spent a glorious week camping in Kakadu National Park. It is a wilderness of harsh beauty and vast silence that has witnessed immense geological changes over more than two billion years. Its current landform of ancient escarpments, rocky outcrops and fertile floodplains holds the stories of countless generations of indigenous people, people whose custodianship sustains the land as much as the land sustains its people. Early each morning during our trip we, my travel companion and I, walked in meditative silence along dry riverbeds, through rocky gorges, past billabongs and savannah bushlands and instinctively, my being recognised, as it always does in such places, an unhurried rhythm that is as old as life itself. The beat of the heart of an ancient land is no longer crowded out by noise and demand but offers itself as a balm mind and heart. Visiting this continent’s wild places has always awakened in me a sense of belonging that is both surprising and comforting. I remember the moment vividly when, for the very first time, age 21 and newly arrived on this continent, I felt a surge of pleasure when the desert landscape and my being met; as if a chemical reaction had just happened I felt wildly awake and safe at the same time, my cells recognising a familiarity that defied logic. A dozen years later, when my heart was broken ferociously and needed mending, I headed out into the wilderness to reclaim my belonging. In the excellent company of my dog I journeyed to some of the most remote places on this continent-with my map as a guide I followed only the smallest dotted lines to places that had only rarely seen visitors. 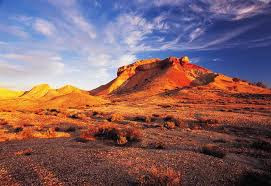 Starry nights, the mournful howl of dingoes, freezing desert mornings, long hikes on land that would not have felt many footsteps before, baths in steaming hot bore water witnessed only by baffled wild cattle, the ever-present smell of campfire clinging to my clothes, rust red sand staining my bare feet for a long time to come. My home consisted of my trusty four wheel-drive, my tent, a camping chair with yellow and white striped canvas, a nifty wooden fold-up camp table, and Molly, the dog. My ‘other life’ faded as I travelled deeper and deeper into this ancient land. There were long periods of just sitting in the midst of a vast wilderness, steaming hot cup of tea in hand, letting the sounds and the silence echo within my being. Everything was a discovery and the more I became part of the ancient rhythm of a well-ordered natural life I realized…or perhaps recognised…the fundamental place I have, and as an extension, each of us has, within creation. 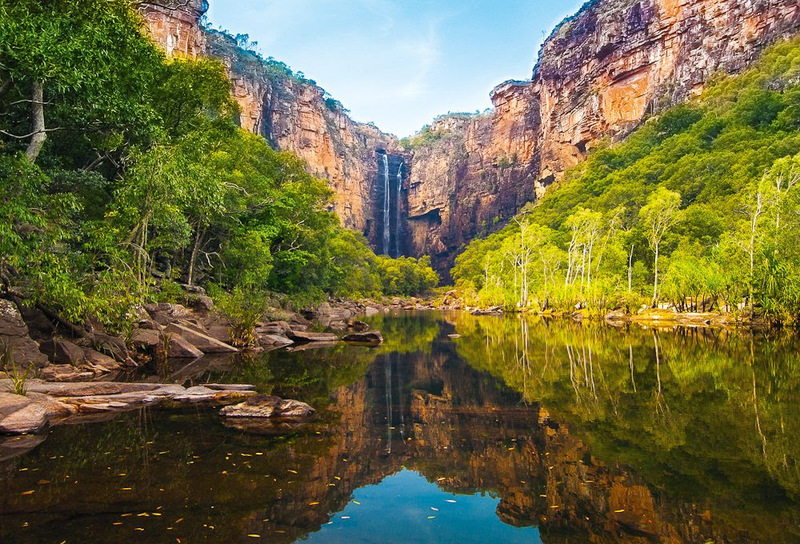 In the years since, I have returned regularly to the wild places I love, deepening connection and renewing belonging as I did on this recent trip to Kakadu. As most travellers know, being ‘on the road’ sparks conversations with strangers. Unlike in my life back home where busyness gets in the way of connection, I am intensely curious to hear more about the stories of the people I meet along the way. I chatted happily to the two women at the Jabiru supermarket (thank you both for an excellent soy flat white) about the changes to the town now that the closing of the mine is only a few years away; I yarned with an older aboriginal man about his concerns for the youth of his village in Arnhem Land; I joked with the young English guy who’d found a job in roadworks turning the Stop/Slow sign eight hours a day in searing heat until he said “I get really weird thoughts doing this all day” -his voice trailing off and his face becoming solemn. I shared a break and a cold drink with a woman from Tasmania, part of a gang commissioned to repair walking tracks in National Parks. Her work patch that day was along a sandstone cliff covered in ancient aboriginal paintings. “It may sound weird” she almost whispered, “but I see the figures on the rocks move out of the corner of my eye”. I knew what it’s like when the senses begin to be tuned to a greater spectrum of experience and we talked deeply. The late, great poet Maya Angelou said: “You only are free when you realize you belong no place — you belong every place — no place at all.” This quote might take some time to digest and relate to but I have found it to be true. To invite myself to belong I pause, steady my breath and fall into rhythm with all that is until I sense my ‘belonging to every place’. But drawing from the teachings of the Buddha I also know that my being is created moment by moment by all the forces of life present in this moment there is no fixed self. So I am ‘belonging to no place’- belonging is an interactive process with creation.It’s true though, I think, that true belonging start with a belonging to ourselves. To find a comfortable home in our body, to appreciate the preciousness of our wild and gentle heart and to honour the gifts of intelligence, creativity and humour offered by a remarkable mind. And beneath these active parts of our being, sensing a more spacious place of pure awareness. One: Pause, open to the moment. What is here now? Engage the senses. Breathe deeply in awareness of all of life that surrounds you. Let yourself feel. Two: Relax. There will be things in your awareness that are pleasant and things that are unpleasant. Just for a moment, let them be. Breathe. Three: Open. Let yourself be vulnerable, even just for a moment. Let yourself be touched by the beauty and the suffering that is the nature of life, every life. Remember your courage. Breathe. Four: Remember that you are a unique creation that is intricately connected to all other unique creations. You belong. Everyone and everything does. Breathe.